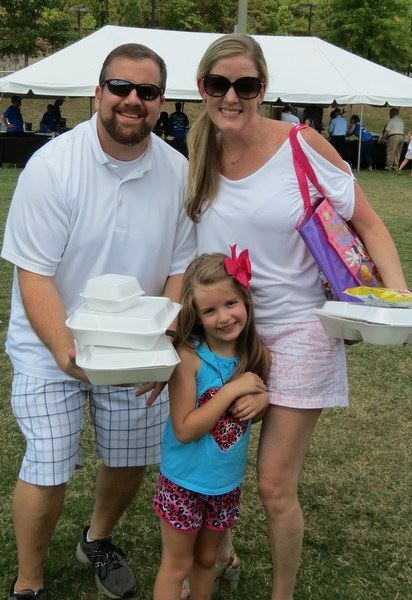 Photo is of Allen and Shae Halpern with their daughter Ava at last year’s food festival. The Friedman Family Foundation Jewish Food and Culture Fest on Sunday, April 22nd from 11 am to 3 pm will be all about food, with a wide array of freshly made Jewish fare that would satisfy even a grandmother’s high standards. But for us, the Jewish Food and Culture Fest is about PEOPLE. It is about the Jewish community and friends of our community who will gather to schmooze over a plate of brisket with kugel, a corned beef sandwich, or bowl of matzah ball soup. It is about the supporters of six Jewish organizations in Birmingham coming together to celebrate our work. It is about the lovers of Israel, who will carry blue and white flags, place a note in the mock Kotel (Western Wall), and experience an Israel Defense Force obstacle course. It is about Israel’s 70th birthday. It is about the families who will gather to watch their kids play in the Kid’s Zone, continuing a sense of community connection. It is about the pride felt by the When Pigs Fly Kosher BBQ Cook-Off Grand Champions upon hoisting their trophy after 12 hours sweating over a hot grill. And it is about the scores of volunteers and staff committed to the event: the cooks working in the JCC kitchen the past 6 weeks; the servers and event volunteers tending the needs of guests on April 22; the Food Fest Committee — including Co-Chairs Isa Dorsky, Lori Dorsky, and Jacob Halpern — who have worked for months to bring this event to fruition. We invite you to attend on April 22 to celebrate this inheritance: great food and great people. There is still time to enter a team in the BBQ contest, still slots available for volunteers, and still space for additional sponsors. Contact Dan Tourtellotte at dt@bhamjcc.org or Bob Greenberg at bgreenberg@templebeth-el.net if you would like to participate. Click for a complete schedule of events and menu. Click for more from Village Living.